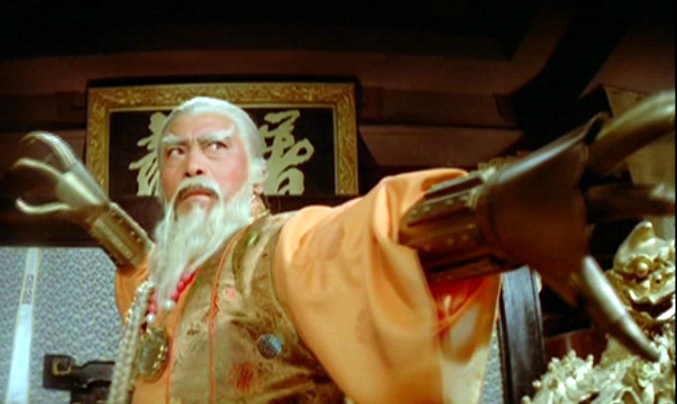 The Avenging Eagle is another in a long line of Shaw Brothers films where quantity was better than quality. The costumes are horrible and some of the sets would look more believable in a 1950’s film rather than the late 70’s. The plot is based off of a wuxia novel by Ni Kuang. A remake in 1993 was made titled “13 Cold-Blooded Eagles” and it was announced in July 2013 that there have been plans for a remake to start shooting in 2014 with collaboration between Celestial Pictures and The Weinstein Company. The plot is straightforward. Eagle Chief Yoh Xi-Hung (Ku Feng) recruits and raises orphans to be his personal army of ruthless killers. However one of his disciples starts to question his lifestyle which eventually leads to him running away and being chased down by his former brothers. During his flight he meets up with a stranger that helps him against his former clan. Now despite all its flaws I’m a real sucker for classic Shaw Brothers so I actually enjoyed the cheesiness of the costumes, the stainless steel chrome polished weapons and the really bad English dubbing. As per usual I would prefer to watch the movie in its original Cantonese with proper English Subtitles. Ti Lung (Return of the One-Armed Swordsman, The Sentimental Swordsman, Drunken Master II) as Black Eagle Chik Ming-sing. The first time I saw Ti Lung in a film was in Drunken Master II as Jackie Chans father Wong Kei-ying. This entry was posted in Wuxia and tagged Alexander Fu, Austin Wai, Eddy Ko, Martial Arts, Peter Chan Lung, Shaw Brothers, Ti Lung, Wang Lung Wei, Wuxia. Bookmark the permalink.